Did you know that RegTech OneTM can facilitate–in less than two minutes with over 91-percent AI-based ground-truth accuracy—the identifying of any U.S. person? You present or email your government-issued identification document (a driver’s license, a passport, etc. ), which is scanned into RegTech One and digitally transmitted to Acuant, our first partner. Next, you must be at a computer with a webcam and microphone. While you are at this computer, Acuant instantly conducts up to 50 tests that analyze your ID document to verify that it is indeed a valid and unadulterated ID. Next, the SysFi.ID tool on RegTech One prompts you to pose for a webcam picture and then asks you to read three sentences aloud in order to match your face to your voice. The SysFi.ID tool then asks you to enter your social-security number and telephone number. Along with your ID-document information, this facilitates the near-instantaneous creation by EquiFax of a short quiz of financial-life questions specific to you. Converus’ AI analyzes the data, and it then reports with over 91-percent confidence whether the person taking the financial-life test is who they say they are. That 91 percent rises even higher with the richer financial-life questions provided in real-time—i.e. precisely like the questions provided by EquiFax. The final step is to write your ground-truth SysFi.ID to BlockDrive, a cutting-edge blockchain technology. 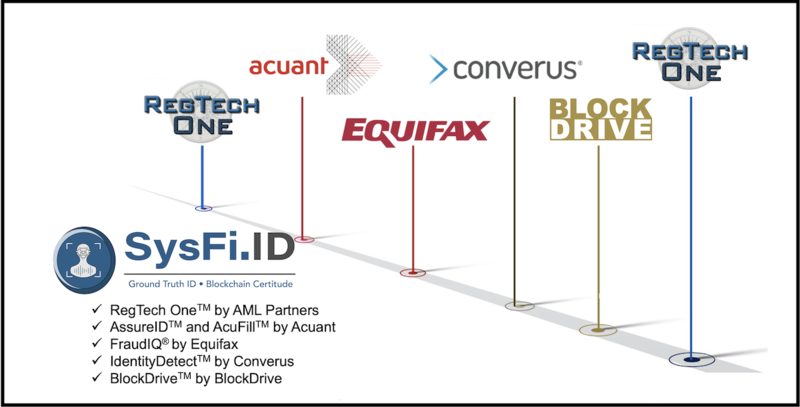 Once your ID document has been validated and matched to your person in real-time and further validated by financial-life questions and kinematics, BlockDrive uses your voice and photograph and related ID data to create the actual SysFi.id. From start to finish, this entire SysFi.ID process on average takes less than two minutes. So what do you have if you have a SysFi.ID? In short, SysFi.ID secures your identity and makes it available in digital form whenever you need it. SysFi.ID records your dual biometric–voice and face–in blockchain where it cannot be stolen or changed. Therefore, myriad applications that use a blockchain reader can verify that your real-time in-person voice and face do in fact match your immutable SysFi.ID stored in blockchain. Imagine the transformation of ID protection possible with SysFi.ID: Crooks and fraudsters could acquire your personal financial data through nefarious means—but they still couldn’t pass themselves off as you because their voice and face can never match your SysFi.ID. We and our partners are tremendously excited about SysFi.ID. And we look forward to even more innovation in this tool—advances like keyboard-less access, access on a range of devices, extensive permissioning options, and so much more. RegTech One is the all-in-one platform for RegTech applications. In addition to hosting all the processes of SysFi.ID, RegTech One provides for users a tech platform on which to stage and interconnect their existing systems. And because it’s a platform built specifically to facilitate Governance, Risk, and Compliance across an enterprise, it’s a platform loaded with Risk-revelant tools, oversight, analysis, and reporting features. With RegTech One, users create from their existing software tools a Network of Applications, and from this network there emerges an Ecosystem of Data—from across the enterprise and facilitated by RegTech One. 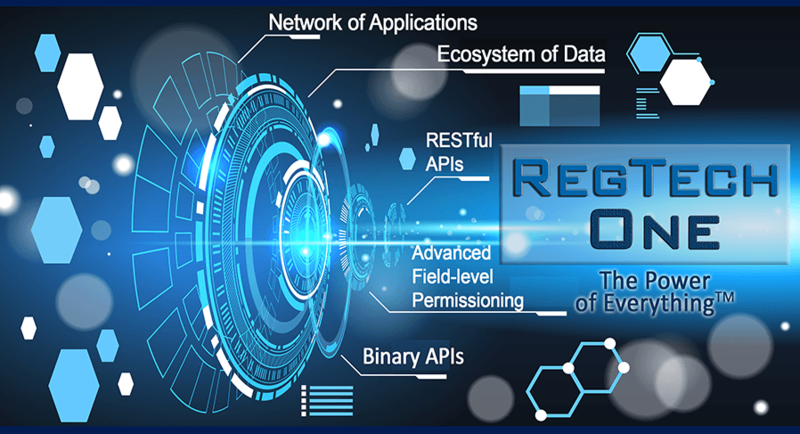 With RegTech One facilitating this Network of Applications and Ecosystem of Data, users then leverage platform features like the Action and Event Libraries, the automated email notification systems triggered by the Action Library, the Dynamic Risk Engine, and the Holistic Screening and Matching Engine, to name just a few Risk-relevant features. And because the RegTech One platform is API-based, users choose their apps, their configurations, their notifications, their data sharing and management, and so much more in ways that precisely support their own specific needs for horizontal governance.RegTech One, in its capacity to facilitate horizontal GRC unique to each user, offers an extraordinary shift in how enterprise users can maximize revenue while also minimizing Risk and achieving Compliance. Contact us today to learn more about RegTech One.